Food photography and recipes continue to be a major brand-building tool for Registered Dietitians and Nutrition Professionals. Aggregating these in one place (a la Healthy Aperture), seamless website integration (a la Wordpress tools and the like), and providing easy organization of steps and ingredients for user print and go are all very popular trends right now - and the tools just keep getting better! Tracking steps, calories, meals, % carbohydrate, grams of protein - the list goes on and while the average user likes seeing this information and can begin to see trends emerge, said user doesn't often know how to create an action plan from this information. Slowly and continually enacting a plan to become healthier is the key. This is why we see a lot of apps emerging using health coaches to prod us along that route. Just remember, if you have very specific, individualized, nutrition and health questions, you should be speaking with a Registered Dietitian as they are the premiere professional licensed to provide individualized medical nutrition therapy (think: drink more water, good job on the serving of veggies with dinner is appropriate for a health coach versus let's focus on high quality, low-glycemic index foods and sufficient fat/protein for blood sugar management at meals, or understanding high potassium and low sodium foods/meal planning for blood pressure management is appropriate for a discussion with an RDN). At this point with healthcare shifting to value-based care and physicians becoming more 'on the hook' for their patients' health and behavioral decisions, the powers that be are concerned, and trying to figure out a solution. We will see more companies that utilize the premiere healthcare professional (yay RDNs - currently only about 5% are credentialed with insurance companies!) and try to increase touch points with the patient. More RDNs in physician offices, more tools for phone and video support (read telehealth reimbursement and improvements in interstate provision legislation), more healthcare dollars that have the ability to shift to healthy food purchases, emphasizing using food for chronic disease management, etc. are just some examples of what's ahead. This is a very interesting time in this space, one that clearly excites me personally as my company, Sitraa, is aiming to make an impact in this space. What are some trends you are seeing emerge in nutrition tech?? I'd love to hear. I'm a huge advocate for taking probiotics to maintain a healthy gut flora. I suppose for those that eat enough fermented foods (kimchi, kefir, etc.) then you may happily skip taking them, but I prefer knowing that I'm getting at least a good baseline of what I need in supplement form each day. They question becomes - how to select and buy them? Unless you have a gastrointestinal disorder or irritable bowel disease (in which case, please contact myself or another RDN that can help guide your gut health! ), I typically recommend a range of strains instead of just finding one strain on bacteria within the probiotic. There is no magic number for # of strains that should be involved but the most commonly found ones include L. acidophilus, B. bifidum, S. boulardii, and L casei. CFU = Colony Forming Units. Despite the fact that the recommended minimum levels continue to creep up slowly, I consistently recommend at least 8 billion CFU. This is a range that is both safe and effective. Something as low as 1 or 2 billion might not make a huge difference in gut health and 8-20 billion safe for the average, healthy adult. Sound like too much? To put it in perspective, therapeutic doses start at about 112 billion and go up from there. LabDoor does very thorough value and quality reviews - when in doubt, check here. First, they may not have accomplished everything I was hoping for as a healthcare professional, but the DGA are certainly moving in the right direction (lowering sodium a bit, adding advice on added sugars, loosening advice on cholesterol). Second, it is meant simply as population advice and not individualized advice. Please go see a Registered Dietitian to have a meaningful, individualized conversation about your needs and strategies to enact those changes. The DGA helps set standards for the National School Lunch Program, the National School Breakfast Program, helps guide %DV on food labels, and provides some talking points and guidance for healthcare professionals, but nothing more. Third, you can do something about it! You can comment during the next comment period (I certainly did this last go-around) what recommendations feel most important to you. You can help move the guidelines forward by meeting your basic nutrition needs (yes, actually getting 5+ servings of fruits and veggies every day) so that as the population as a whole gets healthier, the guidelines can become more complex (maybe one day we'll see commentary on ratio of omega 3s:omega 6s). *Title links to eatright.org's video explaining the DGA. Happy and healthy eating y'all! As you may have seen in recent headlines, the Academy of Nutrition and Dietetics Foundation accepted an undisclosed amount of money from Kraft in a "partnership" that was intended to promote proper intake of Calcium and Vitamin D in children, but resulted in the Kids Eat Right logo on their Kraft singles processed cheese product packaging. This is, quite simply, awful. It has upset myself and thousands of other dietitians who are making their voices heard. I feel it's important to fight for professional integrity and transparency. There is no room for accepting sponsorship money from big food in today's agriculture and health environment. An open letter has been written to the Academy to repeal the seal and create transparency in their (hopefully soon to be discontinued) corporate sponsorship practices. If you support us in this, please click and sign! Admittedly, one of my favorite aspects of the human body for the fascinating role it plays in nutrition. The gut microbiome is the community of microbes, or bacteria, that live in our gastrointestinal (GI) tract. It is a symbiotic relationship with the host body as we provide the home for these bacteria and in turn they help contribute to a large portion of our immune system (some studies cite as much as 70% of the immune system is impacted by the gut flora). In recent years we have begun to link the gut microbiome to various pro-inflammatory conditions such as irritable bowel syndrome, metabolic syndrome and insulin resistance. I feel that we haven't even gotten to the tip of the iceberg in trying to understand the role that the gut plays in chronic disease development. Now scientists are starting to take a closer look at that relationship. Scientists at Georgia State University used the starting point that, "agents that disrupt mucous-bacterial interactions might have the potential to promote diseases associated with gut inflammation" and decided to take a hard look at some of the most commonly used emulsifiers in the food supply. An emulsifier is an agent that improves the texture of food and often adds to the shelf life (for example, it's the reason those particles are perfectly suspended in salad dressings on the shelves but your home-made one separates). In a study that was published in Nature, these scientists found that two commonly used emulsifiers in particular were associated with low-grade inflmmation, obesity, metabolic syndrome, and colitis in mice. This may help provide an additional correlative link between chemicals in the food supply and irritable bowel diseases which have been on the rise since the 1950s. Take Home Message: More real, authentic, sourced food and less processed foods! A message I think most RDNs already push for with clientele, now we just have an extra reference up our sleeve to try to convince one of such! Beward of these red flags, pseudoscience, and fear mongering 'sells' to try to get consumers to pay big bucks for less-than-data-backed info. The science of nutrition is constantly evolving because it is such a young science. That said, please vet your healthcare professionals! In my ongoing effort to stand on the shoulders of giants within this nutrition realm, I love the supportive network of RDNs that are part of the Nutrition Entrepreneurs Dietetic Practice Group. I recently learned about one of these RDNs, Carlene Thomas, who runs her own company called Healthyfully Ever After. 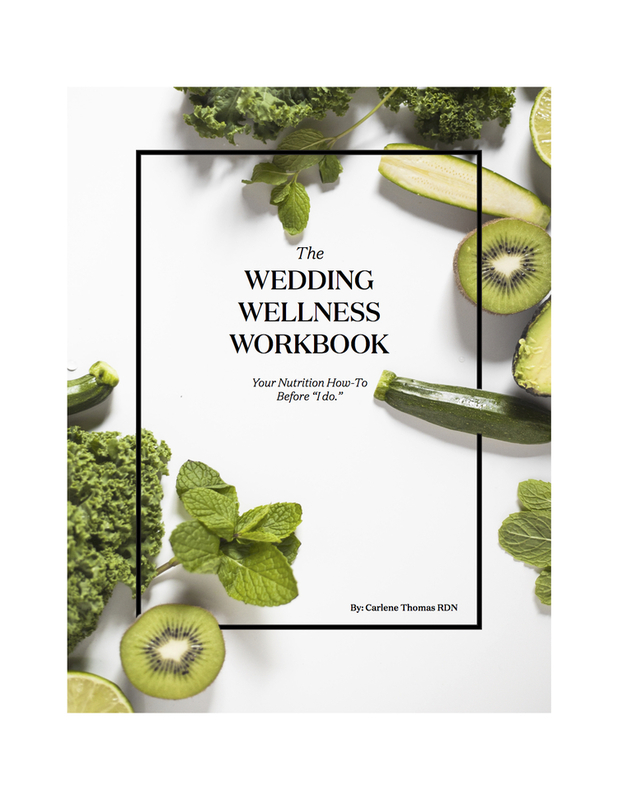 She is doing some fantastic work as she demystifies nutrition and helps brides focus on feeling great for their big day. She is launching her first E-book and if this time in your life is approaching or a big event that you want to feel fab for is on the horizon, I'd definitely recommend checking it out. Happy healthy reading! Inflammation - Consumers will become more interested with the role that inflammation plays in chronic disease development and learn about the big picture of inflammation. This will hopefully lead to promoting fruits/vegetables, fatty fish, nuts and seeds, omega-3s, legumes and ancient grains and discouraging sugar, trans fats, processed foods, excessive grain/starch products, fatty and cured meat products. There is potential for the message to get confusing when discussing things such as types of omega-3 fatty acids (ALA vs EPA vs DHA), proper supplementation, analyzing omega-6:omega-3 ratio, and dairy intake. More ingredient-specific food marketing - With words such as "Natural" and "Superfoods" being recognized as simply media hype, consumers are starting to get more savvy with reading the ingredient list - which means food companies are going to get more savvy with pushing the "good" and denouncing the "bad". Consumer push for GMO information - The debate on GMOs and their impact is only just starting. With the call for more transparency in the food supply, labeling GMO presence is starting to become the standard. Many still aren't sure what to do with this information, but getting it on the label will help further the discussion. Let's get cooking and gardening - This has been on the up and up for years, in large part due to the social media boost of instagram, pinterest boards, and rise of the DIY and food blogging realm. The cacophony begins to organize itself into more concrete messaging and useful layman resources. Everything paleo - This diet became immensely popular for its "what we're genetically meant to be doing" messaging. Most feel it is very doable and satisfying thanks to the high protein intake. As an RDN, I was happy that it encouraged vegetables, fish, eggs, and healthful oils/nuts/seeds, but disappointed that it cut out healthy legumes and took such a strong stance on dairy products. Gluten free - Gluten continued to get criticized thanks to books like Wheat Belly and Grain Brain. I am glad that consumers are tuning into the importance of minimizing refined grains as a whole (gluten containing or not) but also try to use this campaign to educate on Celiac disease, Non-Celiac Gluten Sensitivity, food hypersensitivities, general health and everything in between. Juicing/smoothies - Somehow instead of eating fruits and vegetables it became much more popular (read: healthier) to drink them instead. While those smoothies are definitely packed with nutrients, many are lacking when it comes to fiber. Thankfully the juicing trend is starting to head back in the direction of smoothies with the option of adding ingredients like flaxseed oil, chia seeds, Greek yogurt, oats, etc. Butter is back - From the New York Times articles to the publication of The Big Fat Surprise by Nina Teicholz, last year saw the tides turn back toward encouraging fats in the diet. It is a worthy message after hearing 30+ years of low-fat as the major factor in heart health, but beware of trying to over-apply this to all of the fats that we know contribute to heart disease. Embrace nuts, seeds, nut butters, various cooking oils, and avocado as one's primary fat sources and add in some cheeses, dairy and butter in moderation. I love this - everything I've been saying for the past year synthesized nicely into a fun, 5-minute video!! A must watch. Nutrigenomics is the study of how food and nutrition impacts gene expression. For example, there has been som research conducted in the realm of soy intake and breast cancer risk/recurrence to determine if intake of this phytoestrogen impacts genetic expression that in turn causes cells to mutate into cancer. Nutrigenetics is the study of genetic predisposition for disease and how nutrient intake is impacted and can play a role in the disease. Until looking into this recently I hadn't really known how nutrigenetics applies in clinical care, but after much reading and on the shoulders of a fantastic professional group (shout out to Nutrition Entrepreneurs Dietetic Practice Group) I have come to learn a lot (still not enough!) about a gene mutation that impacts absorption of B vitamins. That gene mutation is MTHFR. MTHFR is an abbreviation for a fancy-schmancy 25 letter word that describes a specific gene found on chromosome 1. If this gene is mutated, MTHFR enzyme is not made properly. If the MTHFR enzyme is not made properly, it can impact proper methylation of folate for absorption, other B vitamins such as B12 absorption, and the amino acid pathway that converts homocysteine into methionine (very important amino acids for protein formation). If something is going awry in these pathways, it can impact a whole host of conditions, including fatigue, heart disease, fibromyalgia, neurological disorders, fertility, and the list goes on. I am unfairly trying to explain a wide array of metabolic pathways shortly into a blog post, so if interested I'd suggest reading more about it. The interesting part for us RDNs is learning to help read bloodwork and correlate clinical exam findings in helping to identify patients that would benefit from genetic testing. The most rewarding part is that the solution to the problem can be supplementing vitamins in their proper forms (in this case often methylated folate) that are going to be used efficiently by the body. Don't you love a simple solution to a genetic problem? I do. With the changing weather I've been super into hiking outdoors recently, but some of these apps helped get me through this long winter and stay fit!